The revolution will not be televised. It will in fact, be streamed. If you are a music fan who has not spent hours poring over the virtual aisles of new music to be found on Bandcamp, you are missing out on one of the potential futures of the music industry. You are also missing out on some great music, including the epic, progressive metal of Canadian band, Pomegranate Tiger. 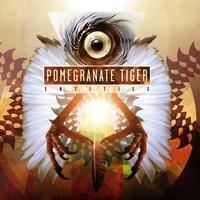 Pomegranate Tiger, whose name originates from a Salvador Dali painting, formed in 2010 in Windsor, Ontario, Canada. This experimental progressive metal band has recorded a tight set of instrumentals for their debut album, Entities. Made up of members Martin Andres on lead guitar, fellow guitarist Matt Shaheen, Keith Wilkinson wielding the four-string and Phil Gatti on drums, Pomegranate Tiger strike an excellent balance in their particular brand of prog metal, with interesting compositions and diversionary directions in their pieces without degenerating into senseless noodling, and playing just close enough to the mainstream line to appeal to non-prog fans without sacrificing anything for the cognoscenti. Entities is available to be listened to for free as a stream from Bandcamp, by individual song and as a top-to-tail album experience. Upon its release, the album became the best-selling album in the Metal category, and the eleventh best-selling album across all genres on Bandcamp. Take a listen and if you like Pomegranate Tiger, you can pay for a high quality MP3 or lossless FLAC download so you can listen to them away from the confines of your computer. The band also has CD versions available through their online store and one can hope they will at some point offer a vinyl version of the album as well, as you can hear just from the stream how a bit of 180g warmth would make them sound even better. Don’t let the lone, quiet guitar chords and atmospherics fool you. This is but an intro track to bigger and louder things. Phil Gatti’s drum roll heralds in those bigger things and the crunch of the guitars lets you know that this is not instrumental background music. Indeed, the experimental song structures the band starts out with here and continues across the whole album are exercises in focused listening. Martin Andres’ lead playing is quite strong and accentuates rather than dominates the piece. On this track however, Andres is right up front, with some stellar riffing that holds the spots where vocals could be and guitar melodies equally well. There are some interesting moments here, especially right before the three minute mark, where some heavy alternative rock styles are mixed in. The guitar crunch is set aside for a moment, as this piece focuses entirely on piano, in short but pleasant composition. This is by far one of the strongest tracks on the album. There isn’t a truer test of the mettle of a prog band than an epic which runs longer than ten minutes. Pomegranate Tiger pull out all the stops on this one. The musicianship is fierce as are the constantly shifting passages. There is a great, prog-thrash section around the five minute mark, even. Where some of the earlier pieces sounded like they were played mostly in Drop-D tuning, this sounds much closer to a blend of standard and Drop-D. The lead melody which Martin Andres plays is fantastic. Playing very much like an extension of the previous track at the outset, especially on the lead guitar, this song continues the mood established by the first half of the album. It features solid playing, no noodling. It has been far too long since I’ve run across a proper trilogy contained on a single album. The opening movement is an exercise in quieter playing not previously heard on the album, but the ship is sailing into rough waters. Playing out exactly as the name implies, the more aggressive playing returns, again with a stunning lead riff from Andres, whose tone demonstrates he has spent considerable effort in getting his sound dialed in. The composition of the trilogy, especially this piece, leaves room in the listener’s imagination for a future iteration, replete with an orchestra. The White Ship has survived the Maelstrom and reached a destination. The band returns to a quieter set of melodies, which further demonstrates their shared versatility as players. Here is the album’s magnum opus. Clocking in at 11:32, the band performs this one with metallic fury. The sections shift and morph into one another so fluidly, listeners could easily find themselves in something of a trance (much like I did) as they follow along until the song comes to an end. Following the thunderous sturm und drang of the previous track, the album closer shifts to a quieter motif, letting the guitarists’ gentler tones through. The band adds a bit of violin to this one, which sounds so fitting and furthers the notion that the music of Pomegranate Tiger, while deeply rooted in the prog metal tradition, could match quite well if played alongside orchestral instruments.